Some news: the project, in an official sense, has yet to begin. Yet were I might have once allowed this to bother me I feel oddly reassured in the plan that lies ahead. That is, even though the start we envisioned never took off some other kind of beginning did take place when we arrived to Esmeraldas some few days ago. 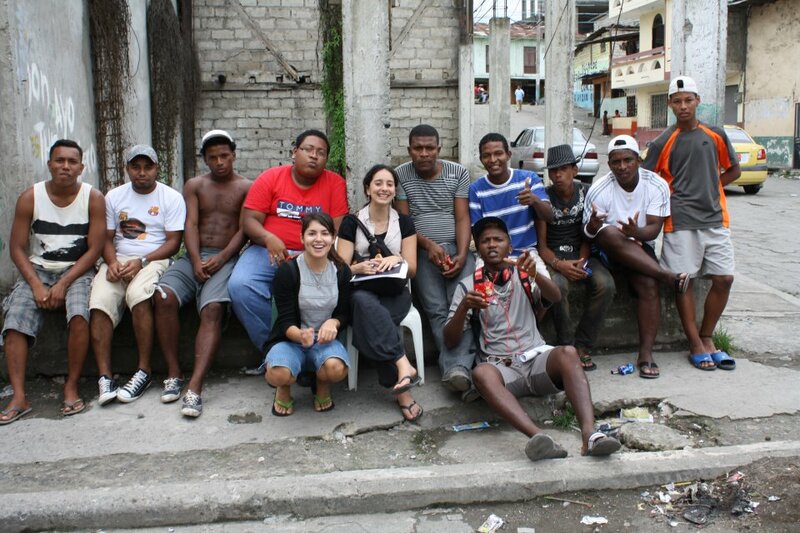 Since we have been here we have met with different youth groups from distinct sectors of Esmeraldas city. Each of them distinct for although the province allows them to share certain culture features not each neighbourhood has the same promise for quality of life as the other. In spite of the differences I have felt very honoured having had the opportunity to meet with these groups and have always felt fortunate that they are willing to open some small window into their lives. Everyday I learn a little more about Esmeraldas culture and a little less about how the development in this country has successfully proceeded without such a significant population of inhabitants – and on what justified basis? Even a little research will lead you to learn that the best ‘futbolistas’ in the country are AfroEcuadorians or that the world tallest mangrove forests exist in Esmeraldas, or even that there are rich coastal resources coming out of the province. Despite what this province has to offer they have often been sidelined when it comes to the hour when the state hands out its precious goods and services. Communities producing the most to receive the least. However while I could expend all my energy crying inequality, I might then miss the incredible initiatives that are in momentum. Many of them manifest in the form of youth driven projects in which they have come to understand that in order to be recognized more equally in the political system there is a larger push they will have to manage outside of the system. So here they are, meeting weekly/bi-weekly, hosting events, promoting their events and getting the word around and largely without the support of external organizations: not NGOs, not international institutions, not government. An impromptu discussion outside our project workshop site with a few of the participants and our local coordinator Jose brought this into perspective for me. One of the guys, an 18 year boy named Leonardo who is head of his own youth organization with some 40 members, had told me how is pro-activity in being a community leader from a young age allowed him to participate in events across the country and even across the continent of Latin America. I was very impressed but wondered why I was surprised. His next story however would enlightenment me as he recalled being approached by drug seekers and being discriminated against as a delinquent during a visit to the country’s capital, Quito. I took a step back to review his profile: a slim boy still growing into his body with a suave hat atop his head to compensate for his younger-than-his-age-looks. Such a warm genuine soul and yet for his appearances is assumed to be a far darker character, a person whom he openly says he never has aspired to. I was made to think again about the assumptions we make about people and thought: although I did not place him in severe categories the way he had experienced in Quito, why did I not assume his abilities? We think a lot more easily about limitations when we are in areas where the quality of life is less. Which is silly really, if you think about how much more these individuals are in a position to impress. The whole ‘fighting against all odds’ concept that they are able to posit and yet we would not think it until the moment when this person has struggled to get his story out there. So I guess having met these groups has allowed me to better orientate myself in this project. Because the purpose of 100 voices is really about getting those stories out there and give each person a platform they deserve. Not everyone’s story will be heroic in the traditional way either; I expect that we will find just as many project leaders as we will mobilizers, organizers, whatever role you can imagine but they are the mover and shakers of their community. So, I look forward to having my perception challenged on what ‘participation and contribution to your community’ looks like and I already thank the youth I have met prematurely for putting me in this mind frame. It is for all the reasons above that this project has begun – just, not in the traditional way. Posted in 100 Voices, EcuadorTagged 100Voices, afroecuadorians, youthBookmark the permalink.